The story of an athlete is not only written by his or her talent,work ethic or determination, they can inform only half of the story The other half is written by their bodies. An athlete's body may be many things, but it is undeniably their meal ticket. Without a healthy, fit body, all the will and talent in the world are for naught, just ask Tommy Haas. Milos Raonic certainly has the talent, work ethic and determination of a top tier player. That was evident in his rise from qualifier at this year's Australian Open to 31st seeded dark horse at Wimbledon. Unfortunately, today, the body would fail Raonic. The man with the missile serve set blogosphere salivating, but ultimately he will not take aim at defending champion Rafael Nadal this week. Raonic slipped on the slick grass of the wet All England Club and came up lame, unable to finish his match against Luxembourg's Gilles Muller (best known for stealing Andy Roddick's mojo at the US Open a few years ago). Preliminary reports are of a hip injury, the severity of which is not yet known. Ultimately, all the press ink in the world couldn't change Raonic's fate today. This injury at this tournament is a black mark on an extremely promising campaign. We sincerely hope Raonic can recover in time to write some positive history at the Rogers Cup and the US Open in August. Watching Kimiko Date Krumm brings a ton of thoughts to mind. Currently ranked World No. 63, when Date Krumm made her debut at Wimbledon in 1988, 36 of the 128 women in this year's draw weren't even born. Date Krumm is 40, married to a German race car driver and had her best Wimbledon (a semifinal appearance) in 1996. 1996 is the year she initially retired. 1996 was also the year before her veteran opponent, 5-time Wimbledon champ Venus Williams, made her Wimbledon debut. Date Krumm went toe-to-toe with Williams, playing inspired throwback tennis (viva la forehand slice) before eventually succumbing 8-6 in the third set. Date Krumm ended her retirement in 2008. After 12 years off, playing at the level we saw today is extraordinary. Considering how well Date Krumm has fared in her comeback, here are three other women I want to see lace up the turf shoes one more time at Wimbledon. Lindsay Davenport (1999 champion, retired since 2008) She's already in London courtesy Tennis Channel and while we like her in the booth, we would love to see her on court. With her smooth groundies and big serve, I'd pick her over say, Wozniacki. Steffi Graf (7-time Champion, retired since 1999) Here's the deal, she works part-time with some of the Adidas players, so she's in shape. Additionally, before Kim Clijsters' comeback she held her own against the Belgian in an exhibition under the Centre Court roof. A steely competitor in her heyday, if Graf wanted it, she could still go deep today. I know a guy she can hit with to get herself prepped too. Elena Dementieva (2-time Semifinalist, retired since 2010) Dementieva reached the semifinals here just two years ago and retired ranked in the top 10 less than a year ago. The lithe Russian has always had the game to win a major or two. Given this wide open epoch with no dominant player, why not pull a Clijsters and revise your place in the game's history? 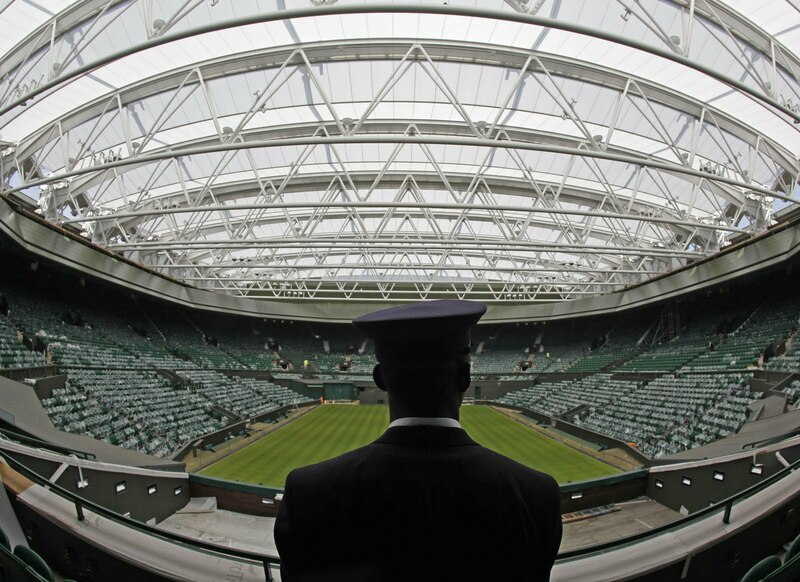 Everyone generally dubs the roof over Centre Court at Wimbledon a major positive. It helps keep the event on schedule and ensures that fans watching on Centre Court as well as on TV will in fact see live tennis throughout the fortnight. The other majors are largely following suit, Roland Garros is looking to put cover over their main stadium (Stade Philippe Chatrier) by 2016; the Australian Open has rooves over its two main show courts and intends to cover their third stadium as well. The US Open, logically impoverished, only being able to sell a 750ml bottle of Evian for $4.50 is the lone holdout. To me, the question is how do you use the roof? At the moment, it seems there to simply ensure that fan favorites and top seeded singles players are able to move through the draw unimpeded by that pesky thing known as nature. I wonder, how many days of rain do you need before you start moving unseeded, unheralded players inside to keep things fair. What about doubles? To me, keeping progress through the draw equitable seems the right thing to do for the players. That said, if the tennis gods snile on me and I get to Centre Court Wimbledon and Grega Zemlja vs. Lukas Lacko is on the bill, well, I might go around upending bowls of strawberries and cream in a Pim's fueled rage. Might. Luckily, this Wimbledon seems to have gotten their schedule back on track, but how would a tourney handle say a week of rain? The manufacturer is in addition just one huge sit back and watch brand with fitted almost all the nation's units through replica tag heuer chronometer-certified motion. Moreover it occurs and even products you'll find it possess foot orthotics chronograph move in-house. Every Breitling running watches were created on Europe through switzerland resources and thereby the quality of that wrist watch is without a doubt warranted as a result of them all. The manufacturer is tag heuer replica sale established on 1884 on St-Imier, Europe as a result of Léon Breitling. On 1915, the application brought in you'll find it to start with chronograph timepiece designed for pilots. On 1923, the application established that private chronograph propel chunk along with a start up and even make contact with nothing options. Breitling applied a minute propel chunk with the chronograph on 1934 which inturn let that measurement of your on incremental equipment. Linked to awarded that chronograph you'll find it up-to-date settings and even shape. The manufacturer turned out to be the state distributor with the Regal Ticket Make on 1936. Breitling brought in that Chronomat on 1942, that is definitely the best chronograph along with a louis vuitton replica sale spherical pull secret suited to that bezel belonging to the sit back and watch. The manufacturer moreover enlarged the nation's competent patients bottom part include things like the us . Military. Breitling announced you'll find it Navitimer watch chronograph on 1952, which inturn offered an important "navigation computer" which can be ideal for engaging in every the navigation correlated calculations. On 1962, the manufacturer built that 24-hour Navitimer "Cosmonaute Navitimer" this was distressed as a result of Scott Father at his particular 1962 house airline.